Judy Blume will be speaking at the University of Hartford on June 21st as a fundraiser for The Mark Twain House & Museum. I’ll be interviewing her onstage and taking tons of audience questions. In preparation, I will be reading her complete works and blogging about the experience. Get your tickets here. Sally J. Freedman sees Hitler. She sees him sitting on benches in her new neighborhood. She sees him talking with a friend. She writes letters to the police about him. You don't know me but I am a detective from New Jersey. I have uncovered a very interesting case down here. I have discovered that Adolf Hitler is alive and has come to Miami Beach to retire. He is pretending to be an old Jewish man. Sally also is the director and star of self-written plays about alternate endings to her family's Holocaust story. - It's all over now, Sally tells Lila. You're safe. I'm taking you home with me. You can share my room. My father will make you new teeth. He's a very good dentist. - How can I ever thank you? Lila asks. - Don't even try... I'm just doing my job. .... When they get home, Sally is a hero. There is a big parade in her honor on Broad Street and everyone cheers. The people watching from the windows in the office buildings throw confetti, the way Sally did when Admiral Halsey came home at the end of the war. This novel, which takes place in 1947, is at once the most autobiographical and the most tonally complex of Judy's books. It has the same uproarious voice of Sheila the Great, and on the surface makes light work of the horrors of World War II and its effect on the psychology of children. 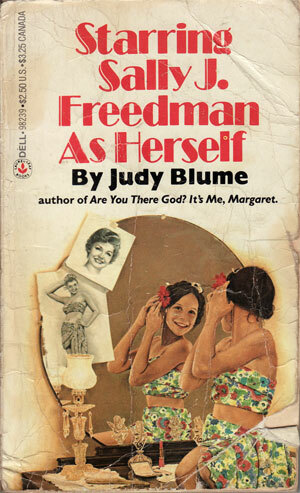 But, being a Judy Blume book, it isn't really light. Its premise is so strong that I can't believe it had never occurred to me before: in the forties, for a nine-year-old Jewish kid, three things were at hand. A supervillan with a strange and confusing death; faraway families members of mysterious and almost exotic stories and dangers; and the ever-growing popularity of the movies. For a kid with any sort of imagination (so, every kid), this must have been a recipe for fantasizing of the darkest order. Of course kids will fantasize about capturing Hitler. Of course they will go back in time and cross continents and rescue relatives they've never met, relatives who they've only heard of as beautiful and tragic figures. That's what kids do, and that's what children's literature does: it endows children with power. In this case, the author does not fantasize for the child. Sally is no Harry Potter and no Lucy in Narnia. Blume shows us her fantasy, and shows us older kids, other kids, adults-- rooted very much in the pain and healing of the real world-- trying to pull her through a normal fifth grade year. Everything turns out fine for Sally, of course. She has a mother and father and brother who love her. In many ways this reads like any other Judy Blume book for pre-teens. But in another way, it's easy to love Sally's voice and hope that she gains the empathy her neighbors wish she had for the poor old Jewish man she has mistaken for Hitler. We know she will find that empathy. We know she will, because that voice will grow into another voice who will write many, many books packed from page to page with empathy for kids everywhere.